This article will show the Eclipse technologies stack consisting of Eclipse E4, EMF and XWT in action. First, we will have a look at the functionality the application has to provide, then see how this can be done using those Eclipse frameworks. All business cases can already be handled by the Geoff project. The interesting part is what frameworks we want to use to implement the requirements. Obviously, as the title says, we have chosen Eclipse E4 as the platform, EMF for modeling the business domain and XWT for declaratively defining the UI via XML. 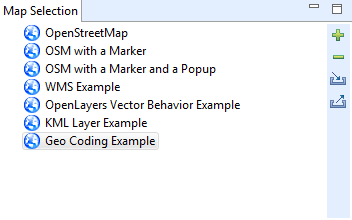 There is a base object GeoMap which has a list of Layers which can be any of Markers, OSM, Google, etc. 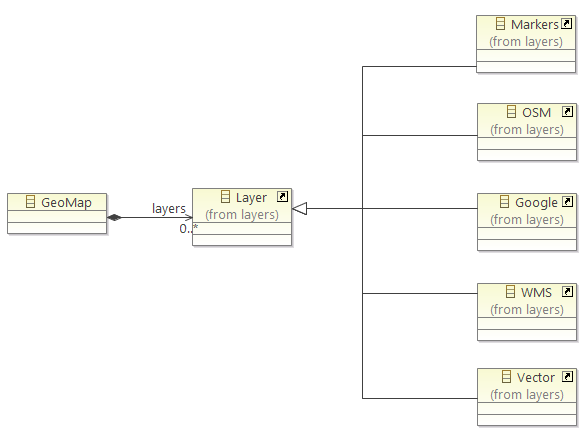 The full ecore meta model is available in the Geoff git repository. To simplify the UI development, we will use the generated edit code of the model as well. 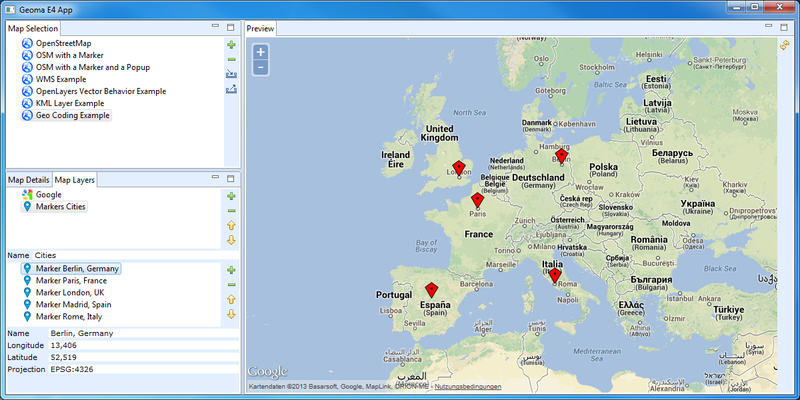 This UI consists of a TreeViewer with the maps configured so far and a Toolbar (style=VERTICAL) with the actions. As you can see, we are using the @Inject annotation to get missing input, in this case, the DI will provide an AdapterFactory instance to the constructor. Furthermore, we make the content provider be able to hide all children in our root object (GeoMap), that is, we can make the content provider to only return a flat list of the elements. Background: JFace's ListViewer does not allow to show an object's image out of the box. The label provider of our TreeViewer is configured in the same way. How would you listen for the TreeViewer's selection and put it to your IEclipseContext? This tells XWT to listen to the viewer's singleSelection property and export it into the current IEclipseContext. 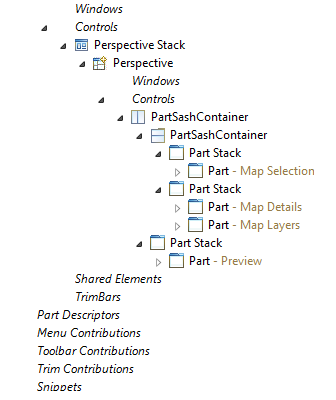 Remember that Eclipse Contexts are hierarchical: if you are in a Perspective, then each part inside that Perspective has its own context. So, we have to walk one level up from the current context. 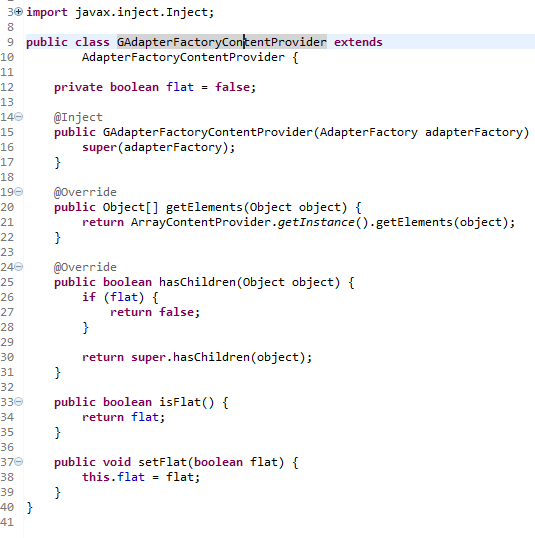 In the Java code we have called context.getParent(). In the XWT Export instruction we do this by providing the level argument. In this case level="1" just means one level up, so, the export will be done in the Perspective's context and the object is available to all other parts in that Perspective. The first thing to note is that the key point to using the E4 integration of XWT is to subclass your part's POJO from E4XWTUI. 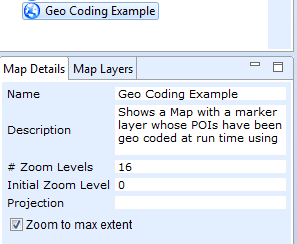 Next, we annotate all fields we are interested in to be injected and define the event handler method newMap() which will be called once the ToolItem is pressed. The next big step is to make different XWT UIs communicate with each other. In the prior step we listen to the TreeViewer's single selection property and export it into the current Perspective's IEclipseContext to make it available to other parts. 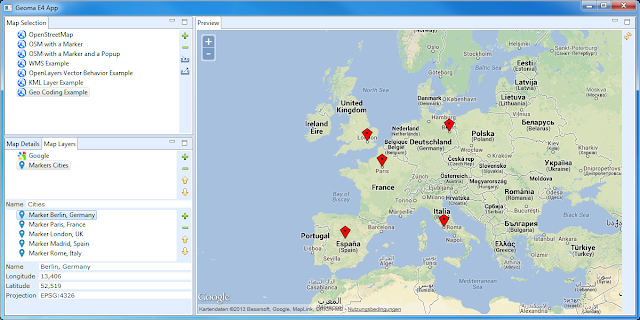 Once the selection of the maps viewer changes, it will be exported for use with other UI parts. 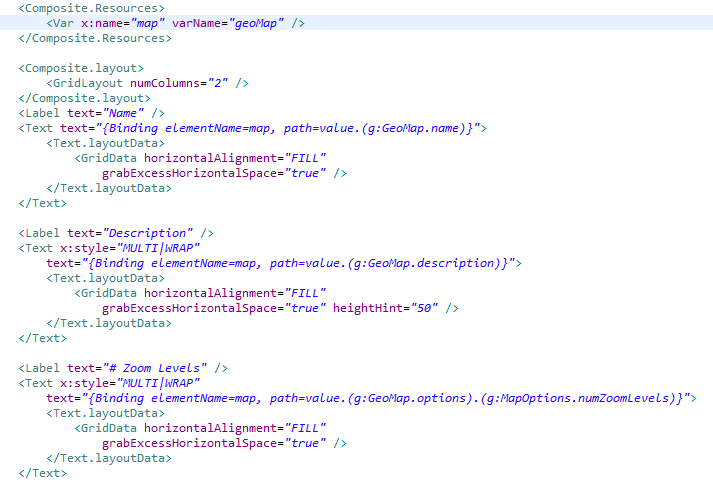 x:name="map" tells XWT to name this object "map", so other objects can reference it inside the same UI definition. 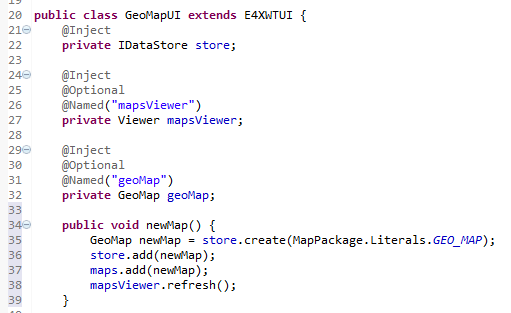 varName="geoMap" tells it to listen for a variable called "geoMap" inside the active IEclipseContext chain. 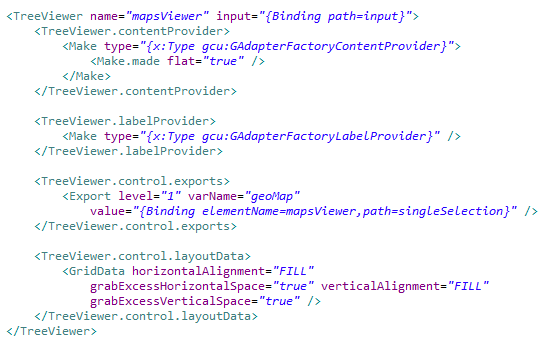 This means to bind the GeoMap object's name property which can be obtained from the previous Var instruction to the text property of the SWT Text control. The remaining UI is done following these principles. The most important part of this article was to show XWT's E4 integration to create very complex and custom SWT UIs. This was achieved by providing the building blocks to make parts communicate with each other by publishing variables and listening to them. This looks great. Is XWT actively developed? Last time I checked the code repository hasn't been touched in a while. Sorry for having missed this comment, Lars. There are users of XWT and there is support on the Eclipse XWT forum, but there is less feedback from the community. My personal point of view is that it is a mature framework with lots of potentials.